Beets are one of the healthiest commonly eaten veggies and one of the highest in antioxidant properties. The leaves are especially rich in antioxidants. They have 9 times more antioxidant activity than your average tomato and 50 times more than orange carrots. Beets are a great source of fiber, folate, and potassium. They derive their red color from phytonutrients known as betalains, which protect against many common cancers. Their nutrient profile supports a healthy digestive tract and cardiovascular system. Beets have a low impact on your blood sugar despite their sweet taste. That’s pretty impressive, but what really intrigued me was the boost in athletic performance beets can provide. Nitrite in beets can reduce your blood pressure, increasing blood flow to muscles, and reduce the amount of oxygen required by your muscles during exercise. The result, being able to exercise longer and expend less energy. British athletes competing in the 2012 Olympics put this to the test by consuming beet juice instead of Gatorade before events. Mohamed (Mo) Farah won the men’s 5 and 10 kilometer races. Quick plug for Eating On The Wild Side. The premise of the book is that we’ve bred varying amounts of nutrition (and medicine) out of much of our fruits and vegetables through agriculture and farming. The good news is, there are still plenty of varieties loaded with nutrition not too far from their wild progenitor. In a nutshell, choose locally grown, organic, heirloom produce with the darkest color. Darker color equals more nutrition the majority of the time. Purple carrots for example are superior nutritionally compared to orange, and darker berries are more nutritious than lighter berries. The book is a fun, informative read, and a good reference for what varieties of produce to select, how to store, and hot to cook to preserve and enhance the nutrition. I prefer beets cooked and usually roast them in a fat such as coconut oil, tallow, or lard. Chopped or grated raw beets are a nice addition to salads. This recipe calls for cooked beets, but go ahead and use raw if you’d like. This smoothie was a little “seedy” from the blackberries and raspberries. I usually chew my smoothies, but opted to drink most of this down to avoid getting too many seeds stuck in my teeth. Enjoy! 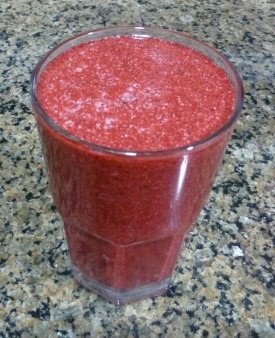 Niko and I would love to know if you try this berry beet citrus smoothie – please leave a comment below. Happy Blending! Tried this, had everything except the beet greens (ate them the night before) so substituted a bit of kale. Also did not have the yogurt so put in a bit of almond milk because I don’t like my smoothies too thick. It was a bit bland, good for you, but bland. maybe I shouldn’t have added the almond milk? Am new to smoothies and am trying all different kinds, probably won’t do this one again, even though I like beets, will probably just eat them. Just tried this, but used almond milk, and extra ginger (I’m a bit of a ginger addict). Delicious. The natural sweetness of the beets is enough for me. I wrap beets in foil and roast them, then peel them when cooked. Didn’t think to use them cooked in smoothies, but will be from now on, thanks. Ginger can be addictive :) That’s how I roast my beets too. I find them much better cooked in smoothies. Thanks for the tip on roasting beets in foil. My mother used to boil them and I didn’t know any other way besides that. I’ve been looking longingly at beets and thinking about buying some. I’ll definitely get on it now! Hopefully those recipes will work for you. Flax seeds are a good substitute for chia. You had mentioned in your article on beets that they contain nitrite. They don’t. They contain nitrate which is converted to nitric oxide which is a vasodilator, hence , the ability to lower blood pressure. Nitrite is what they use in the making of sausage to give it a more appealing look, and which also has been linked to cancer.